Moonstone Cookies are really just sugar cookies minus the rolling out, cutting and decorating. The colors and flavors are added to the dough. Try vanilla, almond, instant espresso, lemon or orange, chocolate, mint, etc. Every cookie is unique with little craters here, bumps there, and marbled colors everywhere. The first ones you make might take a little extra time but once you get the hang of it, you’ll be spittin ’em out faster than the candy machine on I Love Lucy. 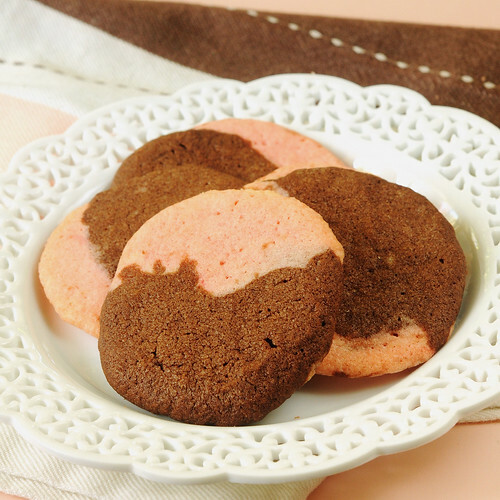 Keep looking below to see the picture tutorial about how to form Moonstone Cookies. Looking for a party or celebration cookie? Maybe something for the Fourth of July with homemade ice cream? How about a shower or luncheon? Or, any occasion where you want to carry out a color scheme. Take a scant 1/2 teaspoon of each color dough and invert each spoon onto a separate corner of a fourth spoon leaving dough behind. 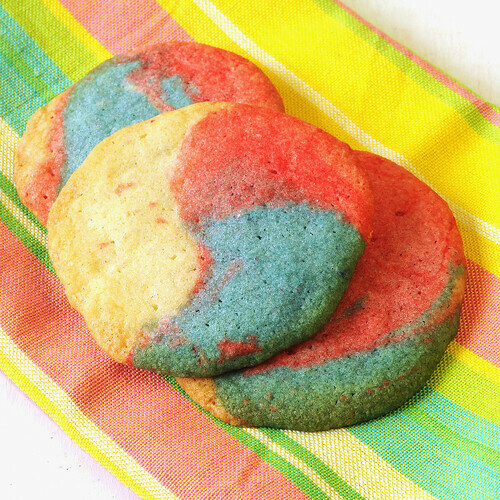 Use a small spatula or another spoon to push all colors off the spoon on to the prepared cookie sheet. Notice the dough on left is rolled; dough on right is not. If dough is too soft, refrigerate for a few minutes until you can handle it. Mash rolled cookies into a flat circle with palm of your hand or fingers dipped in granulated sugar. Just remember. They don’t have to be perfect. Afterall, they are moonstone cookies. Preheat oven to 375 degrees. Prepare baking sheets with silicone baking sheets, parchment paper or spray vegetable oil or butter. Melt chocolate in microwave one minute on MEDIUM. Stir and set aside to melt completely and cool. Whisk or sift flour, cream of tartar, baking soda and salt together. Using electric mixer, beat butter until smooth, about 1 minute. Add sugar all at once and beat another minute--until also smooth. Scrape down bowl and add egg and flavoring. Continue to mix just until combined. On Low speed, blend in half of the combined dry ingredients along with two teaspoons of hot water. Stop and scrape down the bowl. Add remaining dry ingredients and mix JUST until combined. 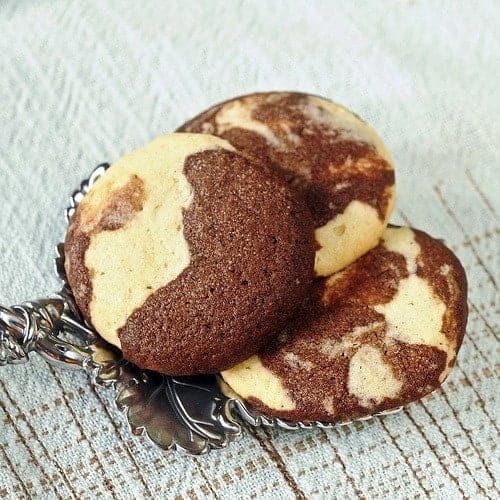 For vanilla and chocolate: Divide dough, putting 1/3 of the dough (about 1 cup) in a separate bowl. Combine instant espresso with 1 teaspoon of warm water to dissolve. Add to smaller amount of dough along with melted, cooled chocolate. Stir until smooth. Let batter sit for about 10 minutes to thicken. For three colors: Divide dough into 3 bowls. Add a few drops of food coloring of choice to each bowl (or none for white). Put a teaspoon in each bowl. Using two teaspoons, scoop 1/2 teaspoon of one batter in one spoon and 1/2 teaspoon of the other batter in the other. With a filled spoon in each hand, invert one color on top of the other and use spoon to scrape off the dough. 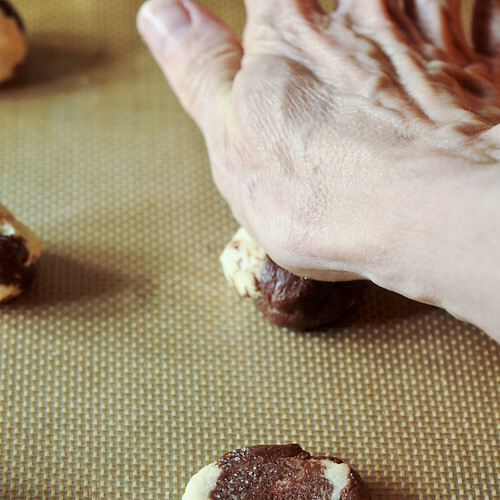 Use spatula or another spoon to gently ease dough onto a cookie sheet so that both colors are exposed. Take a scant 1/2 teaspoon of each color dough and invert each spoon onto a separate corner of a fourth spoon leaving dough behind. 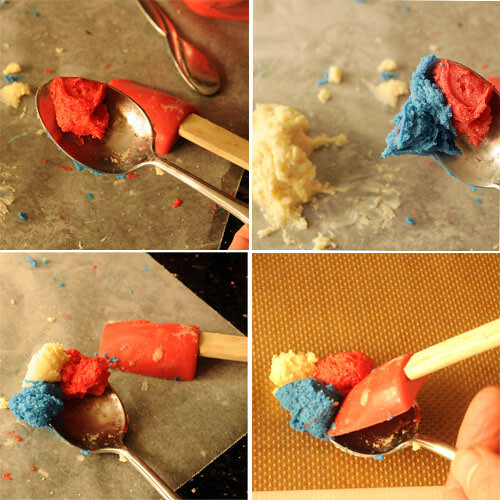 Use a small spatula or another spoon to push all colors off the spoon on to the prepared cookie sheet as seen below. When you have filled the tray, quickly and with a light touch form each "lump" in to a ball. In picture below, dough on left has been rolled; dough on right has not. If dough is too soft, refrigerate for a few minutes until you can handle it. Note: All dough should be of similar consistency. If using chocolate and it gets stiff upon standing, add a few drops of hot water. Bake in 350 degree oven for 9-11 minutes.The longer you let them bake and the browner they get, the crispier they will be. If you like a softer sugar cookie, pull them out of the oven when they barely begin to brown and don't smash them quite as thin. This recipe gives instructions for the vanilla and chocolate moonstones seen in the top picture. 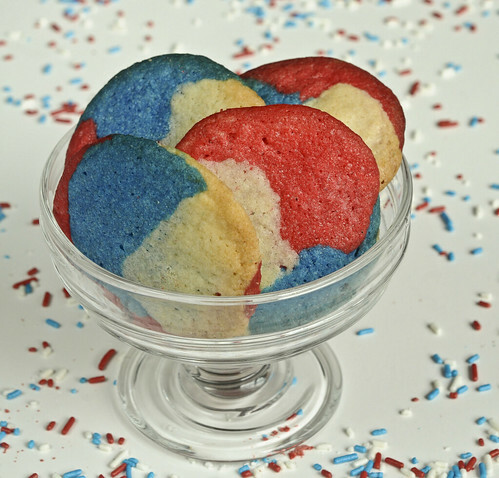 Leave out chocolate if making the red, white and blue cookies or multi-colored party cookies. What a fun little cookie. Great photos of the steps involved. I have to try these, they look like so much fun! Except i’m not a huge fan of crispy sugar cookies… wonder if you could add /subtract some ingredient to make them soft sugar cookies? Tia, you can make these softer by not mashing them very flat before baking. Also, bake just until they barely begin to turn brown. Chilling the dough will keep them from spreading as much which makes them softer. 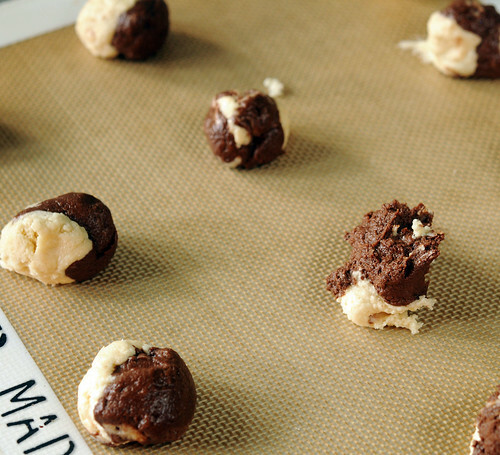 Just stumbled upon your blog via Cookie Madness. I love it. The writing is great and your pictures are gorgeous. Those do look really fun and yummy and I love that they are versatile for so many occasions. these cookies looks so funny and yummy! Wow. They are super cute, but how do they taste? 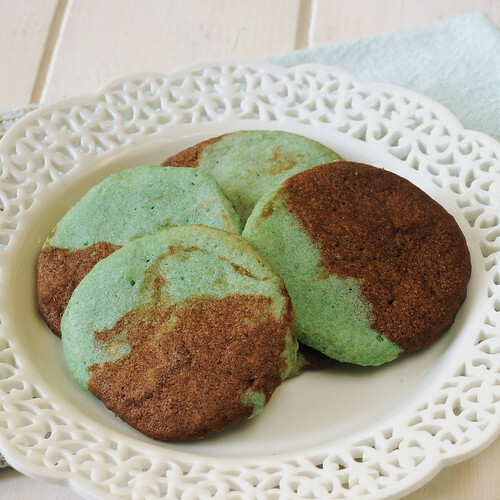 They are a crispy sugar cookie with vanilla flavoring and deep chocolaty flavor swirled throughout. Cookies look great and I love how you went to the trouble to provide a coordinating back-drop to each cookie. Your 4th of the July ones are great!